4 Username, Server, Group, and VM Mapping Information Username Server Mapping Windows XP Mapping Group Mapping user111 esx4 111 user111 Group1 user112 esx4 112 user112 Group1 user113 esx4 113 user113 Group2 user114 esx4 114 user114 Group2 user115 esx4 115 user115 Group3 user116 esx4 116 user116 Group3 user117 esx4 117 user117 Group4 user118 esx4 118 user118 Group4 user119 esx4 119 user119 Group5 user120 esx4 120 user120 Group5 user121 esx4 121 user121 Group6 user122 esx4 122 user122 Group6 Fault Tolerance Notes VMware Fault Tolerance Configuration Recommendations VMware recommends that you observe certain guidelines when configuring Fault Tolerance. In addition to non fault tolerant virtual machines, you should have no more than four fault tolerant virtual machines (primaries or secondaries) on any single host. The number of fault tolerant virtual machines that you can safely run on each host is based on the sizes and workloads of the ESX/ESXi host and virtual machines, all of which can vary. If you are using NFS to access shared storage, use dedicated NAS hardware with at least a 1Gbit NIC to obtain the network performance required for Fault Tolerance to work properly. Ensure that a resource pool containing fault tolerant virtual machines has excess memory above the memory size of the virtual machines. Fault tolerant virtual machines use their full memory reservation. Without this excess in the resource pool, there might not be any memory available to use as overhead memory. 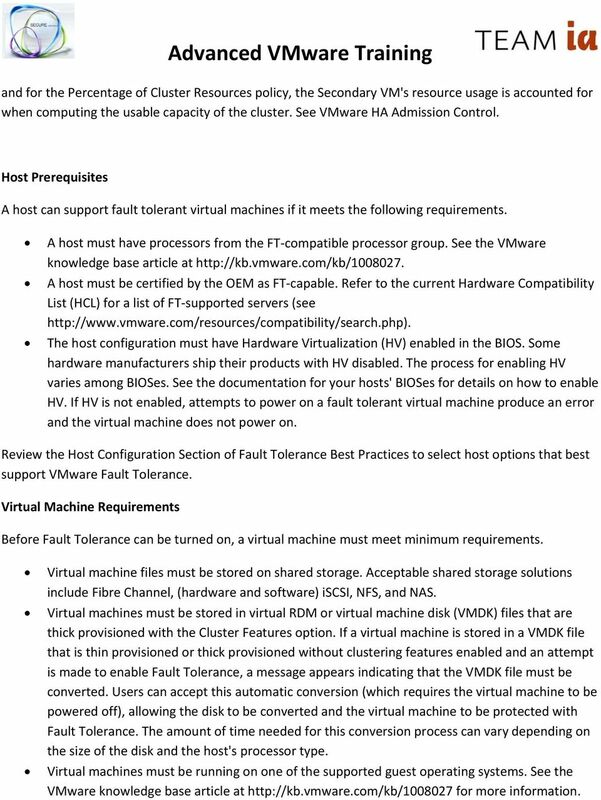 VMware recommends that you use a maximum of 16 virtual disks per fault tolerant virtual machine. 5 To ensure redundancy and maximum Fault Tolerance protection, VMware recommends that you have a minimum of three hosts in the cluster. In a failover situation, this provides a host that can accommodate the new Secondary VM that is created. 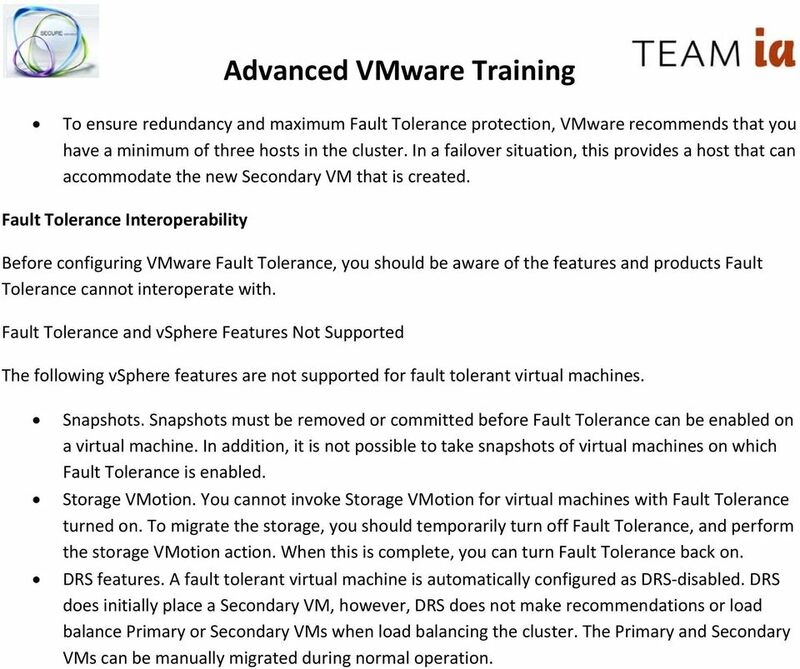 Fault Tolerance Interoperability Before configuring VMware Fault Tolerance, you should be aware of the features and products Fault Tolerance cannot interoperate with. 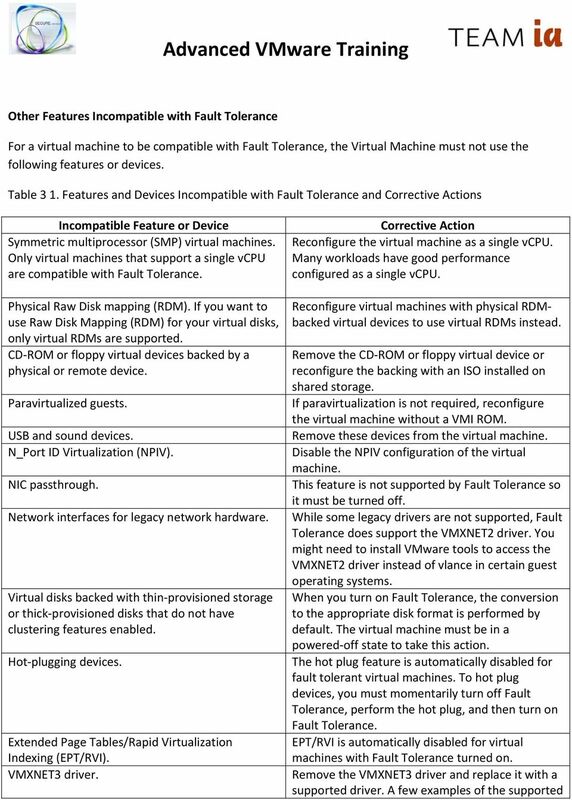 Fault Tolerance and vsphere Features Not Supported The following vsphere features are not supported for fault tolerant virtual machines. Snapshots. Snapshots must be removed or committed before Fault Tolerance can be enabled on a virtual machine. In addition, it is not possible to take snapshots of virtual machines on which Fault Tolerance is enabled. Storage VMotion. You cannot invoke Storage VMotion for virtual machines with Fault Tolerance turned on. To migrate the storage, you should temporarily turn off Fault Tolerance, and perform the storage VMotion action. When this is complete, you can turn Fault Tolerance back on. DRS features. A fault tolerant virtual machine is automatically configured as DRS disabled. DRS does initially place a Secondary VM, however, DRS does not make recommendations or load balance Primary or Secondary VMs when load balancing the cluster. The Primary and Secondary VMs can be manually migrated during normal operation. 8 and for the Percentage of Cluster Resources policy, the Secondary VM's resource usage is accounted for when computing the usable capacity of the cluster. 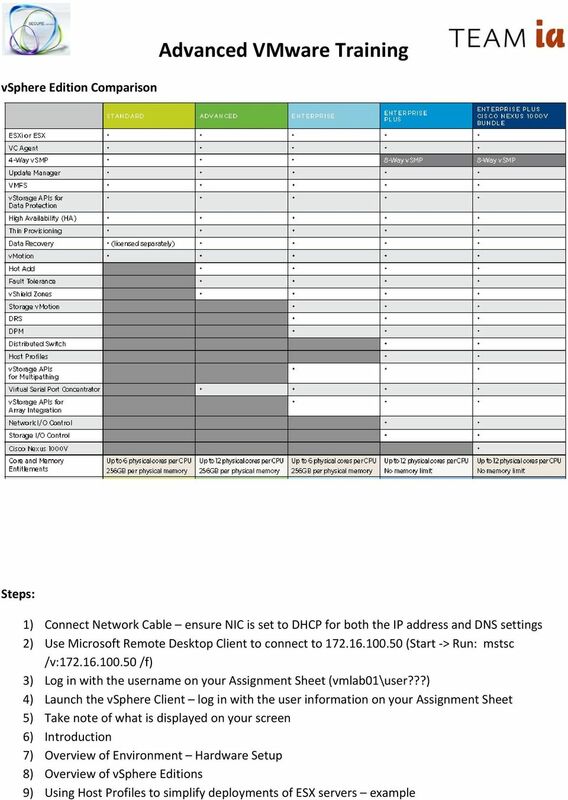 See VMware HA Admission Control. 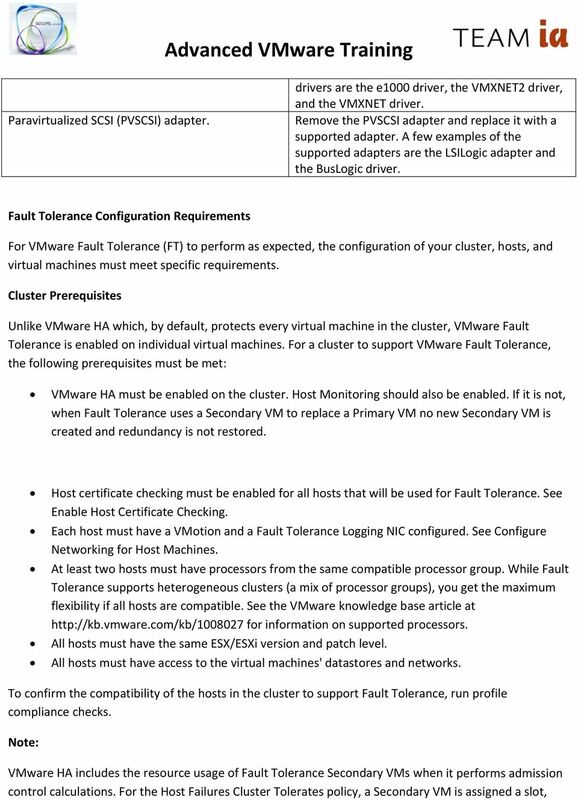 Host Prerequisites A host can support fault tolerant virtual machines if it meets the following requirements. A host must have processors from the FT compatible processor group. 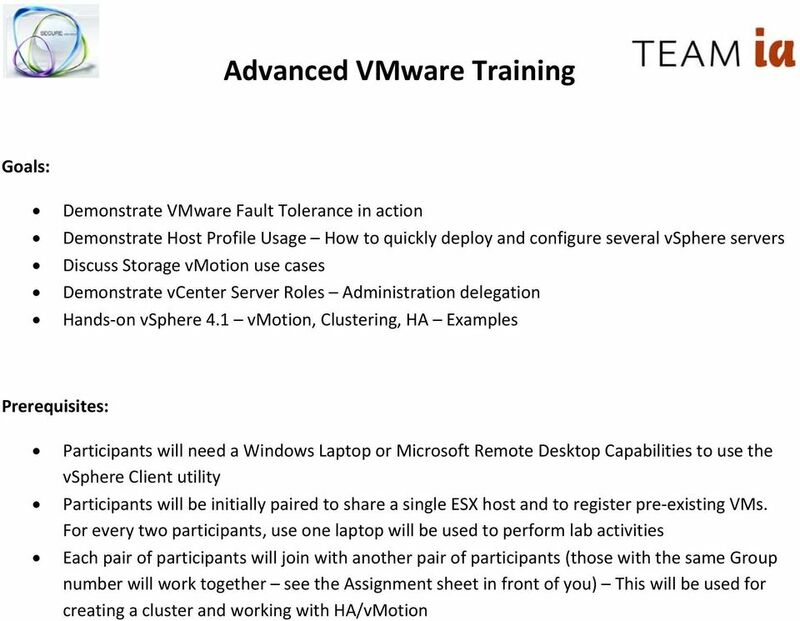 See the VMware knowledge base article at A host must be certified by the OEM as FT capable. Refer to the current Hardware Compatibility List (HCL) for a list of FT supported servers (see The host configuration must have Hardware Virtualization (HV) enabled in the BIOS. Some hardware manufacturers ship their products with HV disabled. The process for enabling HV varies among BIOSes. 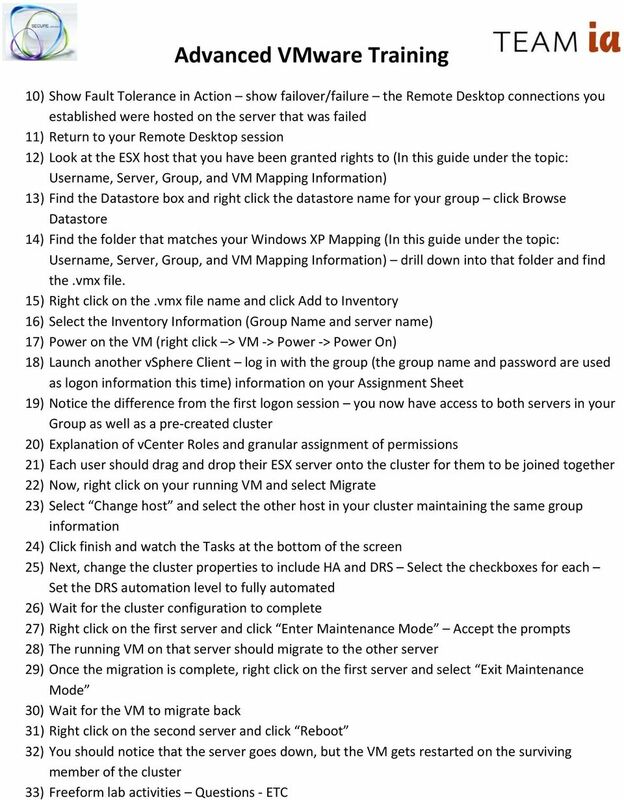 See the documentation for your hosts' BIOSes for details on how to enable HV. If HV is not enabled, attempts to power on a fault tolerant virtual machine produce an error and the virtual machine does not power on. 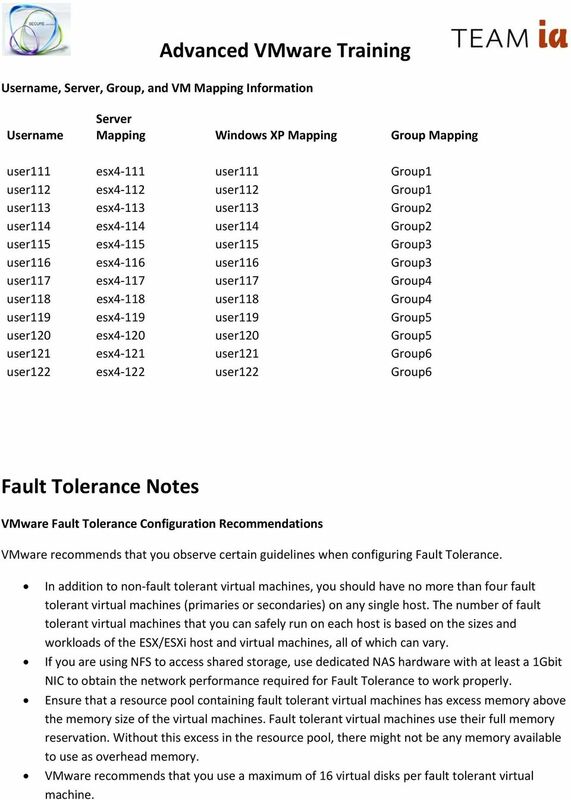 Review the Host Configuration Section of Fault Tolerance Best Practices to select host options that best support VMware Fault Tolerance. Virtual Machine Requirements Before Fault Tolerance can be turned on, a virtual machine must meet minimum requirements. Virtual machine files must be stored on shared storage. Acceptable shared storage solutions include Fibre Channel, (hardware and software) iscsi, NFS, and NAS. Virtual machines must be stored in virtual RDM or virtual machine disk (VMDK) files that are thick provisioned with the Cluster Features option. If a virtual machine is stored in a VMDK file that is thin provisioned or thick provisioned without clustering features enabled and an attempt is made to enable Fault Tolerance, a message appears indicating that the VMDK file must be converted. Users can accept this automatic conversion (which requires the virtual machine to be powered off), allowing the disk to be converted and the virtual machine to be protected with Fault Tolerance. The amount of time needed for this conversion process can vary depending on the size of the disk and the host's processor type. Virtual machines must be running on one of the supported guest operating systems. See the VMware knowledge base article at for more information. www.xtravirt.com May 2007, Version 1.3 White Paper Install and run VMware ESX3 on VMware Workstation 6 By Paul Davey Copyright 2007 1. Table of Contents 1. TABLE OF CONTENTS...2 2. INTRODUCTION...3 1.1.